Chef’s Secret 22-Piece Element is indeed a Super Set. 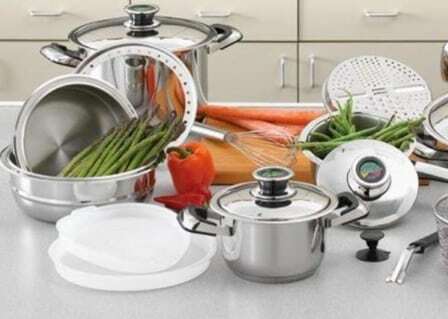 The numbers of the pieces included in this set make it a super set without even having to analyze its other features: different sized sauce pans, lids with thermo control, fryer basket, roaster, mixing bowls, skillets and even an instruction book for cooking waterless are included in this super set. 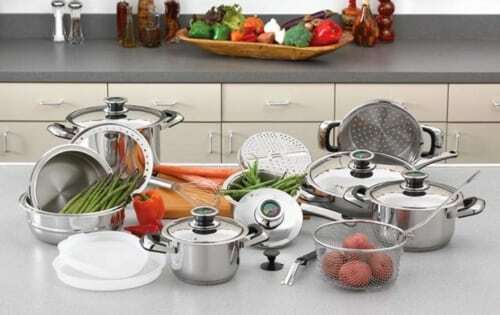 Chef’s Secret 22-Piece Element Super Set is definitely the dream of every person who enjoys cooking or who has to cook for a large family. This set enables you to prepare different types of food at once and have control over the cooking temperature at all time. The design of every piece exceeds the expectations and the lids that fit to multiple pieces are a great advantage. The elegant finish given by the stainless steel is very similar to satin. There are also components made of plastic included in this super set. The handles are fixed with plastic pieces, which are a great touch to the final design. Some of the saucepans, and even the roaster, feature an accurate measurement system in quarts. However, the pots are more spacious than it says they are. In addition, the thermo control knobs are of real help if you like to follow recipes accurately. One much appreciated feature of this super set is the waterless cooking technique. Chef’s Secret Cookware is based on a simple idea: customer satisfaction. 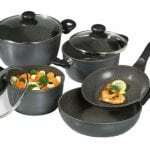 They manufacture pots and pans, cutlery, barbeque sets and different cooking accessories. Their main purpose is to provide products that must not be replaced during a lifetime. 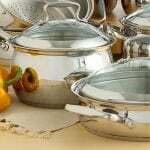 The restaurant quality provided by Chef’s Secret Cookware is their main advantage. 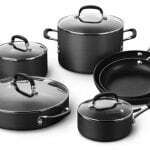 They promote reasonable prices and a highly effective cookware. 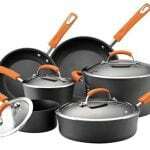 Great variety – This cookware set includes no less than 22 pieces. You will find all of them extremely useful in various situations. Durable materials – Except the pieces made of plastic, all the other pieces are made of surgical stainless steel. This material does not contain nickel or carbon. It is an alloy made of multiple elements. Great looks – Silver and a little black are the main colors used for this super set. These colors are perfect choices for every kitchen, as they blend in nicely in every decor. Highly effective – The materials used for the manufacture of the saucepans, the skillets and roasters are highly durable and effective. 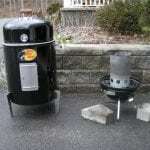 They enhance the cooking process and have a long-life warranty. Waterless Cooking – This new way of cooking ensures a healthier lifestyle and promotes dishes with a great content of vitamins. 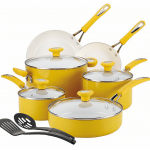 No markings about the manufacturer – None of the pieces contained by this set are marked with “Chef’s Secret” brand. They are labeled as made in China. Plastic finishes do not last long – The plastic pieces from the handles tend to get damaged if they are washed in the dishwasher machine. The diversity of the Chef’s Secret 22-Piece Element Super Set is simply amazing. You might not end up using every component of this super set, but you will definitely enjoy the benefits of most pieces. They are durable, effective, and nice-looking and they cook the best dishes you will prepare from now on, especially waterless delicacies.